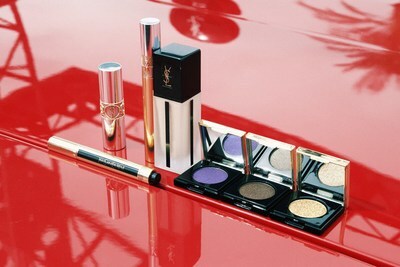 No, that’s not a makeup mirage fantasy in the middle of the desert—it’s the YSL Beauty Station! When driving through Cathedral City along Route 111 on your way to Coachella, be on the lookout for the pink gas pumps and heart-shaped balloons. The YSL Pop-Up Store is your chance to experience the brand's new makeup essentials while discovering the beautiful campaigns of Kaia Gerber. Touche Eclat Radiant Touch, the iconic pen, and Touche Eclat High Cover Radiant Concealer, the new, natural-looking high cover concealer. Rouge Volupte Shine, the legendary moisturizing lipstick, and Volupte Plump-in-Color, a new lipstick with a rock and subversive black balm heart that makes lips feel plumper. Make It Yours—an exclusive opportunity to customize your favorite YSL lipstick. Tom Pecheux Palm Springs Makeup Looks. The Pop Up provides the chance to experience unique interactive moments, such as an exclusive makeup vending machine and a virtual mirror where you can instantly try on more than 50 shades. You’ll be selfie-ready for your music festival desert adventure! Some of the links on our site may contain affiliate links. This means if you click on the link and purchase the item, we may receive an affiliate commission at no extra cost to you. All opinions remain our own.